Do you own a Starbase or an Outpost? Want to know what's happening to some of your existing gear? Or do you just want to blow up some stations? This dev blog by Team Five 0 has some of the details you'll need to know. Why do you seem hesitant to refund deprecated BPOs, making them effectively non-functional? CCP promoting some conflict with these new faction citadels, nice. People who put passwords on char bazaar Eveboards are the worst. Can we get an indication of the size of the rescaled citadels/outposts. What would happen with outpost "eggs" that will happen to be manufactured but not deployed by the date of "upgrade"? You're wasting your time with the rigs relative to outpost upgrades while leaving them worse than Engineering Complexes. Engineering Complexes are already better just more specialized. 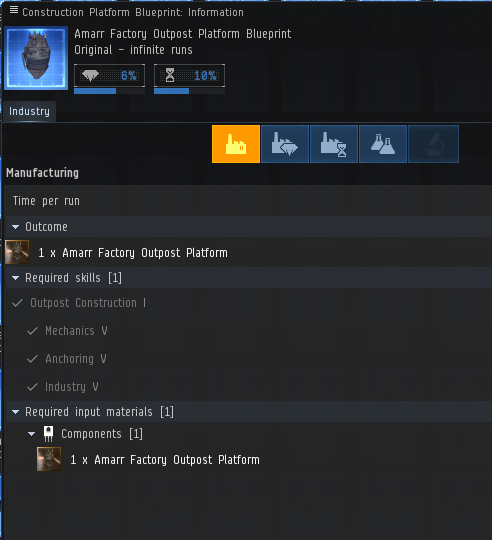 The main draw to keep using ouptosts for industry right now is it is safe, remove that and except for the very few fully upgraded amarr outposts everyone's going to move to Engineering complexes. What will happen to clones in outposts? Currently those clones are perfectly safe but with this change they could be destroyed either through the destruction of the replacement citadel or its unanchoring. Drones. Drones are a means to an end. An end to the ruthless Caldari 'progress' machines. An end to the barbaric 'redemption' proposed by the Amarr. What they see as chaos shall be my perfect order, merely beyond their comprehension. The conversion rate has increased for the removal of POS structures. I'm fine with the timeline, but don;t want to see the loss of bonuses until AFTER the refineries are well established and can be transitioned smoothly. If I put a BPO in for research, and it takes over 1000 days to complete (yes there are some that will take that long), will you complete those automatically in a couple years when its time to end your POS buyback program? I bless this mess! A long time coming and RIP legacy starbase code that has always been a bane to developers. Just curious: Whilst 0.0 ouposts are being removed are there any plans for changes of any sort to NPC-held outposts in pirate sovereignty 0.0 (or low/highsec, for that matter)? Every time you post a WiS thread, Hilmar strangles a kitten. So the current small tower I have, which just does refining and small manufacture will be superseded by the local the NPC. Still waiting to hear when the promise will be kept to small corporations/industrialists. It's not that rare usage of towers when you deploy into some WH system for short time (hours to days). Expedition style. As far as I understand, new structures need a week to unanchor. So, are you planning to support expedition style somehow, new smaller structures?.. how much are we getting back for our researched outpost BPO's??. this has been asked several times and it seems like you guys are just cloaking up and dodging the question. Maxim 6. If violence wasnGÇÖt your last resort, you failed to resort to enough of it. We've got this ever since they announced the plans to replace the towers ( automatic defenses, perfect force multipler, useful for small corps or people with RL ) with the structures ( manual defenses, horrible force multiplier - a small subcap fleet is enough to bring a fortizar to its knees - needing supporting fleet and therefor either big corps or people with a lot of free time on their hands ). I believe as of last November/December (sometime a few weeks after EVE Ascension in mid-November) they shut off the deployment of new eggs. So no new Outposts have been planted in 2017, in short. Citadel doesn't even have to be destroyed or taken down. Owner can just stop fueling the clone bay, shut it off, unplug the service module, whatever. Had two of my PVP clones destroyed when an Ashab citadel owner just dumped every clone in the fortizar at once. thankfully, they were cheap (and my experiment taught me to put my PVP clones back at Amarr trade hub... putting them in a citadel didn't remove the 20 hour timer, anyway). You'd need both one of the new medium refineries later this year and a Raitaru to replace your POS's refining and manufacturing capability at a good efficiency, yes. Or else use the structures of others. Or else use NPC stations and get less efficiency/higher cost/more time spent, etc. I've heard WHers talk of exactly that problem. People entrenched in WHs will be even harder to kick out in this new future, their citadels will be up and if you want to build caps nearby, you won't be able to just pop up a POS and start nice and quiet, your citadel will take 24 hours to anchor and will be visible to all in blue on the system scanner, just like red signatures and green anomalies. Something in between a mobile depot and an astrahus is needed. Something you put up fairly quickly (maybe not 10 secs like a MTU or 1 minute like a MD, but not 24 hours like a citadel, either! ), can tether / dock / both at, and do more than just refit and store one jetcan worth of stuff... CCPls. Oh, it seems like the details for the reimbursement for not deployed outpost platforms and outpost blueprints are missing. Extra items will be sent to either the home station for characters or the delivery hangar in the HQ station for corporations. You're going to convert 2b NPC price BPOs into 6b NPC price BPOs that are about to lose some of their utility to the new refinery structures? Astrahus BPOs have already been reselling below NPC due to overbuying and people hopping on new bandwagons. I could understand if you were wanting to ease the transition from outposts to citadels, but we're more than a year past their introduction and have already purchased and researched the BPOs we require. This might've been worth doing back when Citadel was released, but now you're just devaluing peoples' investments in the BPOs from the last year. Could you let us know why you're doing this? Also, please check that the extra items won't be sent to impound like what happened with SKINs and fighters as it can be very expensive to get them out of there, which is pretty unfair when they weren't there before. The first part of my first question in this thread still seems pretty relevant. Why do you seem hesitant to refund deprecated BPOs, while making them effectively non-functional? I would asume one reason for this is that bpos serve partly as ISK sinks. That's why it can be better for the economy to convert them into there replacement bpos wherever that is posible instead of pumping all that isk back into the game everytime a system gets replaced with something new. I'm just going to echo what people have already said regarding WH gameplay. If a new, POS comparable structure isn't added then a large portion of WH gameplay is going to wither and die, basically. I don't live in WH's myself, but I can appreciate the strategies used, and this kind of emergent gameplay is something that needs to stay in the game IMO. Well... It's not that these BPOs will be 'effectively non-functional'. They still can be used to make BPCs, to manufacture or they can be sold. The Mittani: "the inappropriate drunked joke"
What about an array that would allow "Renter's" to have their own facility to dock and launch from? The Renter's Hub would be smaller hubs capable of handling 10, 20 or 30 hangars for neutral players to base out of. The Renters's Hub would be free of combat involving the Citadel but could still be attacked none-the-less. Outposts and their BPOs have been effectively non-functional for a while now. This dev blog also talks about doing the same to some POS arrays (which is still late), but doesn't mention anything about refunds. * In most cases it is much better to transition them to a different blueprint type instead of giving isk for them. Then we can treat BPOs and BPCs the same and we are not losing the research value of a blueprint. * The exact reimbursement is normally only announced (and decided) after the NPC sell orders are removed from the market: Then there is less concern if the worth of a specific blueprint increases a bit through the reimbursement (otherwise it could be abused too easily :) ). On the other hand, removing the functionality from items/blueprints will lower their worth down to zero. Since the announcement that the POSes will be removed, the modules and blueprints lost even 80%-90% of their values in some cases. How will those be reimbursed ? "These structures will continue to operate for some time longer and any jobs started before the August patch will complete with the bonuses intact." Will research jobs that are still in progress roll into the new fortizar structure after the big day and continue to research, or will they fail? I purposely start very long research jobs in outposts because I don't have to worry about the outpost exploding several months into research and losing my progress. I can see some serious imbalance here with regards to outposts being replaced and destructible. Can ccp make low sec and high sec outposts destructible too? That way eve is in balance all over the everse. As well as powerblocs and blue donuts will go hit all small entities to take away their outpost/faction citadels. Conflict and content is good, its what keeps everse turning, but this is a new low with no measures in place prevent powerblocs running around rampant and taking over outposts, knowing smaller entities cannot fight far bigger entities than themselves. Think this is another ccp fail.